This phone is a magnificent piece of work. Everything about it screams “quality” from the texture of the keys to the styling and heft. Everyone I saw, be they users of iPhones, BlackBerries, flip phones or what have you, everyone thought it was a beautiful piece of hardware. It’s well constructed, uses a fair amount of real metal, and has a weightiness to it that seems out of keeping with its slight frame. And it is slight: it’s nearly as thin as my old Samsung Trace, and it’s narrower than a BlackBerry. I won’t add too much to that except to explain what the “x” means and to note that yes, this is a kickass smartphone. 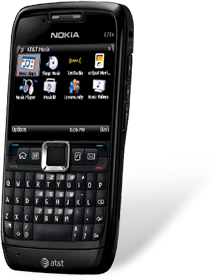 First off, the E71 differs from the E71x in that it uses Symbian 60 Feature Pack 3.2 as opposed to FP 3.1. I know, right? This means there are some drastic UI difference between this and the E71 model. This model also has the FM radio removed. So what do you get for your $149 with 2-year-contract? All the things we loved in the E71 without the price. The E71 costs about $400 unlocked while the AT&T version costs half that. Add in a $50 rebate and you’re down to $99. The device has turn-by-turn GPS built-in, instant and MMS messaging, as well as an HTML browser with 3G networking. The camera is a 3.2-megapixel shooter with video capture and it is a world phone which means you can roam internationally. Because we’ve already gone over the merits of this device in a previous review, I’ll offer a bottom line to those thinking of picking up a Nokia phone on AT&T. I’m of two minds when it comes to S60. S60 is sort of like Android at this point – powerful, wonky, and often modified by carriers to bend to their whims. The E71x has a great messaging system and excellent keypad and the build quality is top notch. This is sort of a Euro BlackBerry without a lot of the business oriented features and makes for a great phone for a user looking for messaging, email, and IM with a little bit of personal information managing capacity.